The Purple mattress seems to be all the hype online recently, but is it really worthy of all that attention? I have tried almost all the high end mattresses looking for relief from my back pain: Simmons, Stearns & Foster, Aireloom, and Serta. Many of these mattresses were $2500 or more. 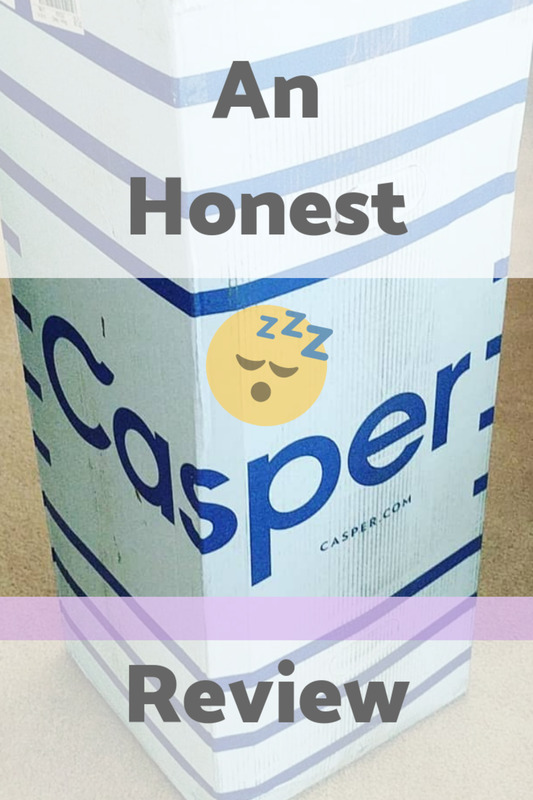 Could this "mattress in a box" really stack up? My goal is to give you an honest review about this mattress based on my experience so you can decide if it’s worth a try. Also, I will discuss the differences between getting the mattress directly from Purple versus getting it through Amazon. Sales tax estimate is based on a purchase of the king sized mattress at $1299 from the State of California. The amount of tax charged will vary by state. Take a look at the Purple mattress at Amazon.com. There are many helpful reviewers that who have also gone to great lengths to accurately describe how comfortable this mattress is. The sciatica problems in my back are gone, and my husband doesn't sweat at night anymore since this mattress is significantly cooler than our last one. The mattress features Purple's trademarked “Hyper-Elastic Polymer” which is formed into a grid like pattern on top of two other supportive layers and it promises to provide a cooler mattress that is both plush like a soft mattress and supportive like a firm mattress. Purple includes a 10 year warranty and 100 nights to try out the mattress with no risk so, with urging from my husband, I decided to pull the trigger and order a purple mattress. Wait a minute! Should I order this mattress through Amazon.com or Purple.com? Well there are quite a few differences between the two options. Still skeptical, I held judgement until I had a chance to sleep on it for a few nights. Should I Order from Amazon.com or Purple.com? My husband wanted this mattress two months ago when I started doing the research on it so I needed to get it fast. I quickly discovered that there were two ways I could get this mattress. If I were to order my mattress directly through Purple.com I am subject to their “lead times” (i.e. how long it takes them to make the product and get it to the shipping company). When Purple has a lot of orders, it could be four weeks or more just to get my mattress out the door and on its way to me! If they aren’t very busy it could be as little as two days. From what I saw from others online it seemed like the typical lead time was about two weeks. That was the case for me; Purple informed me that they were currently about two weeks out from shipping my order if I placed my order with them that day. Shipping would be free (and usually takes an additional two to three days), there would be approximately $100 in tax I would have to pay on top of the mattress price since I live in California, I would have the 100 night guarantee to try out the mattress, and by ordering directly through Purple, I would get their current promotion. At the time I called them, their promotion was a free seat cushion. Seeing how my husband and I currently had our old, beat up queen sized mattress that hurt both of our backs, we were not excited at the prospect of waiting over two weeks to receive our new bed. My purple mattress at my door in two working days. Free shipping and no tax! If I were to order my purple mattress through Amazon there were some significant differences. First, I could get the mattress at my front door guaranteed in two days! That would definitely make my husband happy. Also, for me being in California, there was no sales tax which would save me about $100. Sounds like a pretty easy decision doesn’t it? Well there were two draw backs that I could find to ordering through Amazon. First, I would not qualify for their promotion they have on their website which was a free seat cushion. Secondly, I wouldn't have their 100 night guarantee and would only have Amazon’s 30 day guarantee to try out the mattress. Currently the listing on Amazon does boast “100 Night No Pressure Guarantee” which, as far as I can tell, is completely incorrect. From my calls directly to Purple’s headquarters, I was advised that if I were to order the mattress through Amazon, I was bound to processing any return of the mattress through Amazon and not Purple. Purple representatives were very clear about this and even once I received my mattress there was documentation inside indicating that I would need to process any return through Amazon and not Purple.com. The literature I received also confirmed that I only had Amazon’s 30 days to try out the mattress and not the 100 nights that I would have gotten through Purple. After a short deliberation with my husband we decided to get our mattress through Amazon. 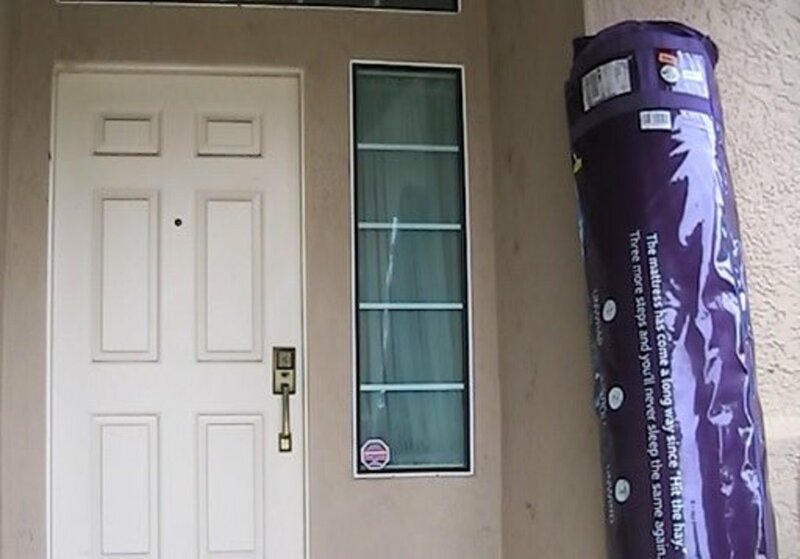 True to Amazon’s word, we received our 140 pound king sized Purple brand mattress on our door step in two working days! 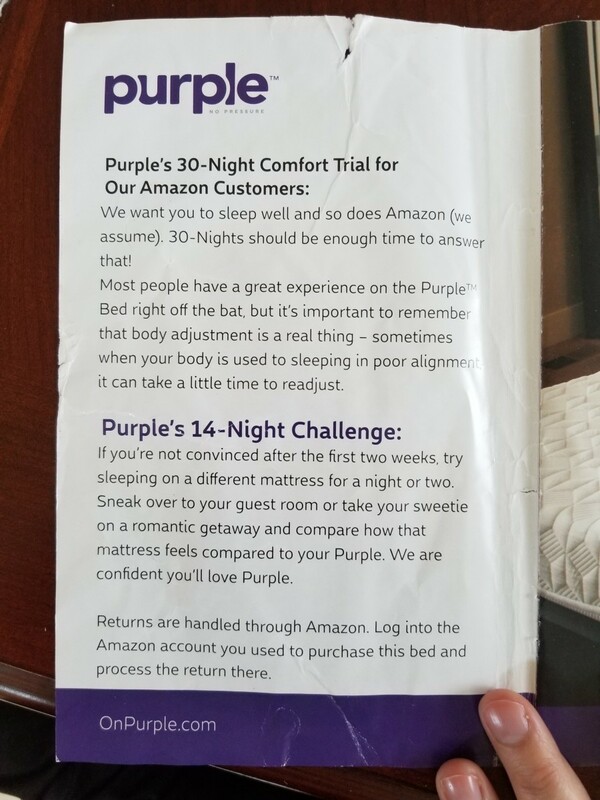 The Purple mattress I ordered through Amazon came with this insert explaining the trial period and how it works through Amazon versus purple. My husband wrestled this mattress to our room and cut it open. This mattress inflated almost immediately and was at its fully inflated size within 15-30 seconds. 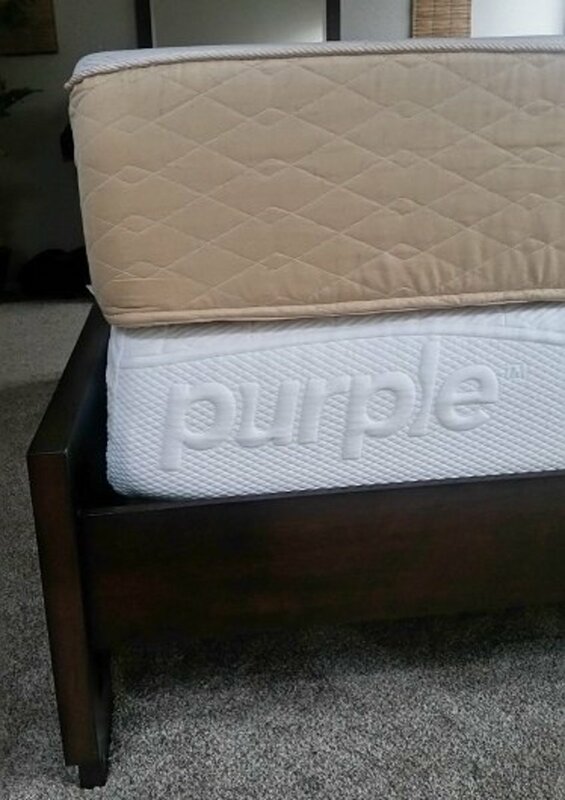 Just to be sure, we let the mattress sit for another 10 minutes or so but it didn’t appear that was necessary and according to Purple’s website it really wasn’t. A few seconds is all that it needed. The first thing we noticed about the mattress was that it was quite a bit thinner than our last mattress. I was surprised that I had not heard of that from any of the reviews I read. It is only about 9 inches thick, whereas our last mattress was about 12 inches thick. My husband is 6’2” tall and about 245 pounds and he was very concerned initially. He was worried he would hit bottom while sleeping on this mattress but we both agreed to reserve judgement until we slept on the mattress a few nights to get a good feel for it. 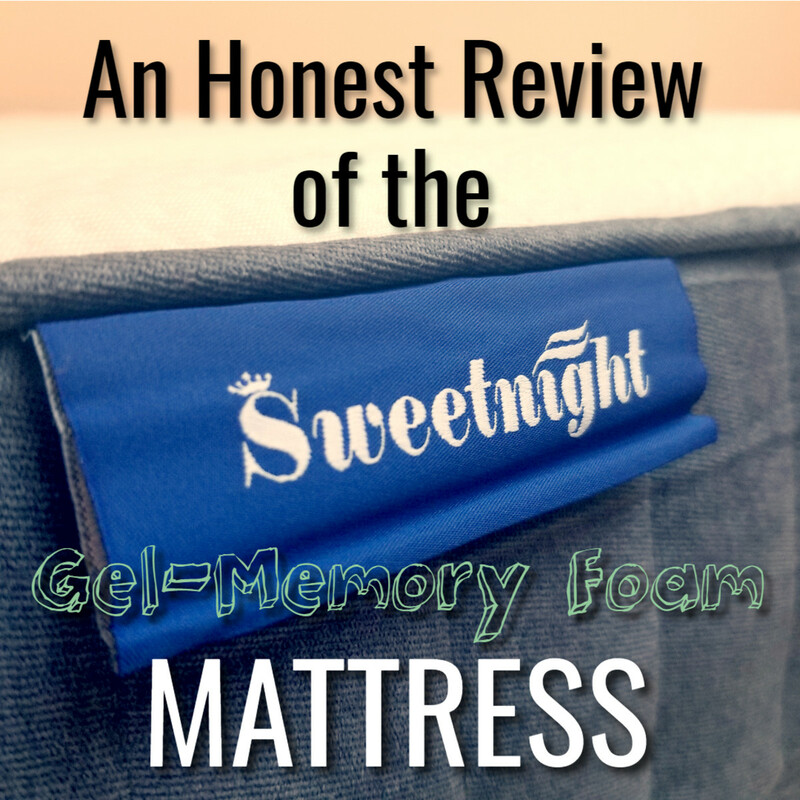 As I write this review, it has been about 6 months since we setup our new mattress in our room. I am very happy to report that my husband has not bottomed out the bed and we have been enjoying our restful nights immensely! Although the feeling of the mattress really is difficult to describe in words, I will do my best. 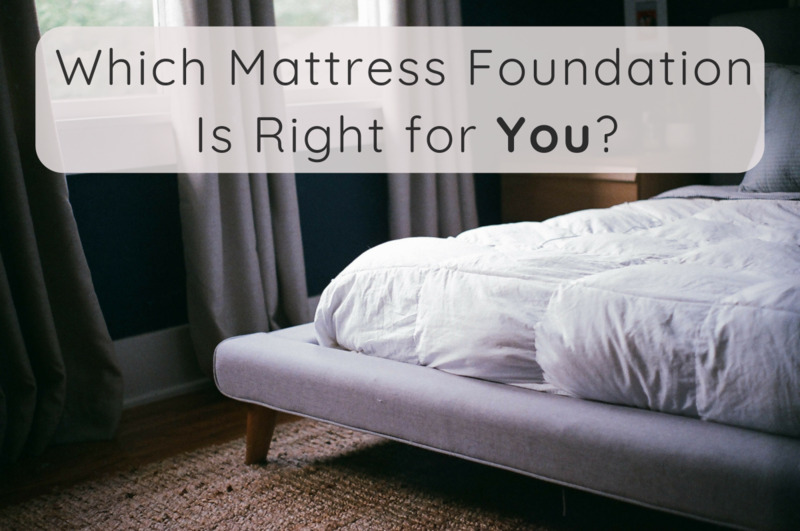 The top layer of the mattress feels both soft and firm at the same time. You can feel the grid like pattern the Hyper-Elastic Polymer has just underneath the surface. Areas where you put a lot of pressure will cause the little grid like polymer boxes to collapse down to the next firmer layer of the mattress, providing a firmer support. Areas where you put light pressure do not cause this to happen and you enjoy a very plush feeling in those areas. The added benefit of this effect, in my opinion, is a feeling like your back is being (very slightly) stretched. Not enough to be uncomfortable, but it was enough to relieve some pressure in my back. Have you ever tried one of those inversion tables to relieve back pain? You know that great feeling of stretching out your back and relieving pressure between the discs of you back when you hang upside down? It’s like that feeling just on a much more subtle level. This has caused both my husband and I to get some of the most restful night sleeps we have ever had along with zero back issues in the morning. Thickness comparison between my old memory foam mattress (top) against the new Purple mattress (bottom). Overall, this mattress has been one of the best investments my husband and I have ever made. We went ahead and also got the matching Purple brand pillow, which also utilizes the same grid patterned Hyper-Elastic Polymer as the bed and is just as comfortable. I have had long time back problems due to a bulging disc in my back. 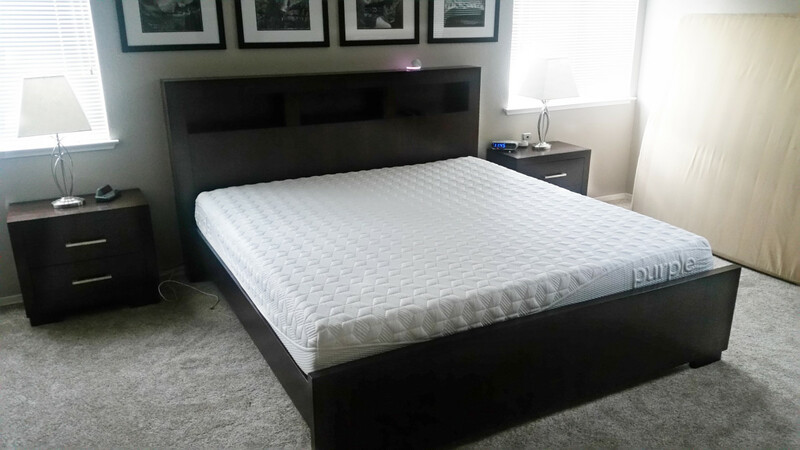 I have also suffered many years with sciatica issues as well and I can honestly say my back has never felt better than it does now with this mattress, and as a bonus my husband never sweats while sleeping like he did before. It does seem to be a cooler mattress than our old one. Looking back, I do kick myself for waiting the two months I did to research this mattress. Those months were filled with back pain and restless nights. I saw the Purple mattress early on in my research and should have bought it then. My only real complaint (which yes, I know, is very superficial) is the thickness of the bed. For purely aesthetics reasons I would love it if it were a bit thicker but it’s a small price to pay for the restful nights I have been having. This is the best deal on a high end mattress that you will find anywhere. I will stake my two months of research on that statement. As long as you can live with it being a little on the thinner side then just get it. You have 30 days to sleep on it and you’ll have it in your room in two short days through Amazon. I promise you won’t be sending it back. If you want to get more in-depth on this mattress, read some of the Amazon reviews or have a look at Consumer Report's Take on the Purple Mattress. This is the best deal on a high end mattress that you will find anywhere. I will stake my two months of research on that statement. If you are at all concerned about the white powder that is reported to be in this mattress, see my research on this topic (the link above). 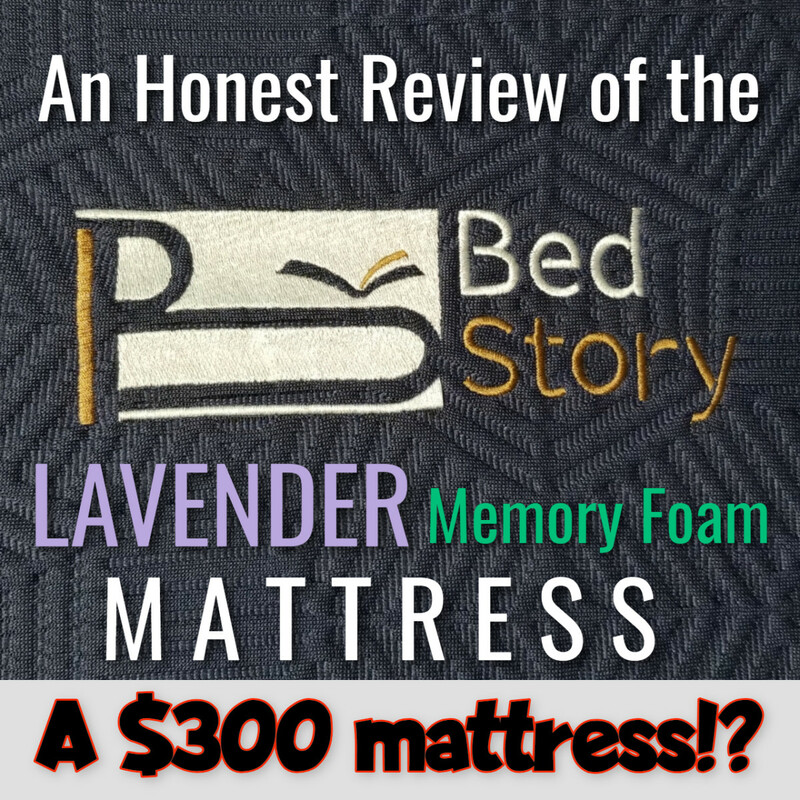 What is your biggest concern when it comes to purchasing a Purple Mattress? The difficulty of returning it if you don't like it. I'm worried about how long the mattress sits in an Amazon warehouse before you order. Do you know how many days is the limit these things can stay rolled up for? 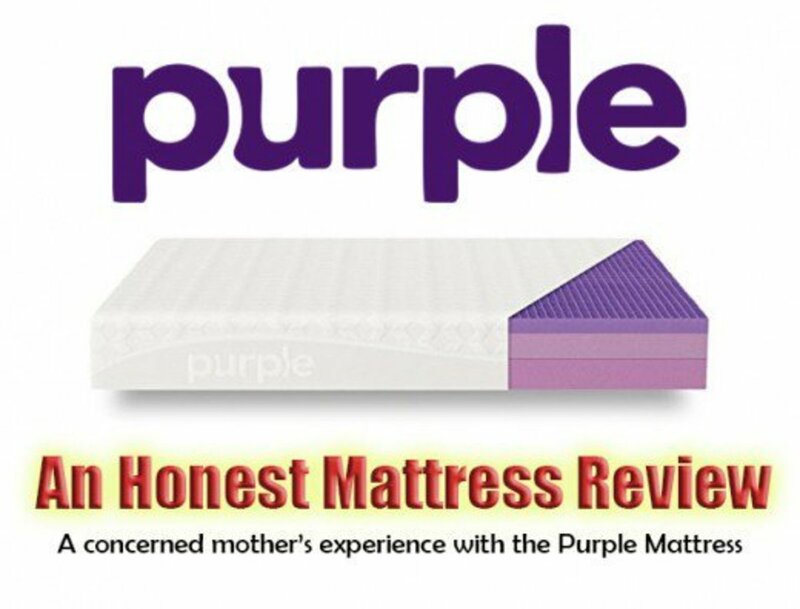 According to Purple, they recommend that the mattress doesn't stay compressed and rolled up for any more than 2 to 3 weeks. Apparently, the main concern after that point is the proper expansion of the comfort grid system. Other than Purple themselves, Amazon is the largest distributor of this mattress and I would imagine that their turnover is fairly high in their inventory. My mattress had no problems expanding and it was fully expanded in probably 15 seconds or so. Hopefully, this helps to answer your question. 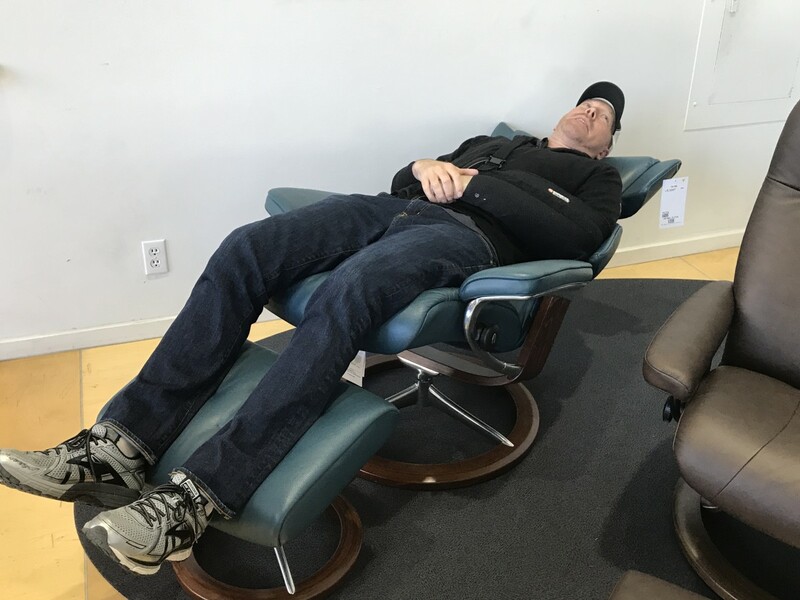 Can you put it on top of a sleep number mattress? I'm not sure what the brand was, but it was a Costco memory foam "mattress in a box." Compared to the Costco mattress, the Purple mattress is lights years ahead. To be honest I didn't ask. It had been 2 business days and the order hadn't shipped yet, Purple's shipping method had delivery out 7 to 10 days past when they shipped and Amazon had guaranteed delivery in 3 days. I am glad I was able to help Eric! Out of curiosity, what was the lead time you were quoted from Purple? I was quoted 2 weeks. Thanks for this post. You made us decide to cancel our direct order and stick with Amazon shipping. Can't wait to see how we like it!